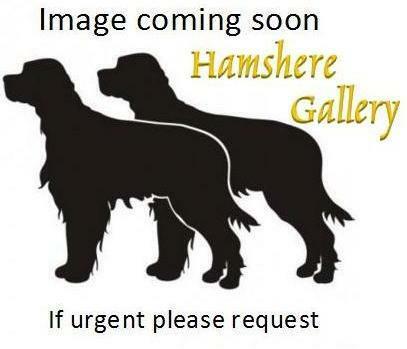 A finely gold sculptured brace of Setter heads with diamond and calibre set collars. 27 ) An American gold set enamel and diamond Boston Terrier tie / stick pin. 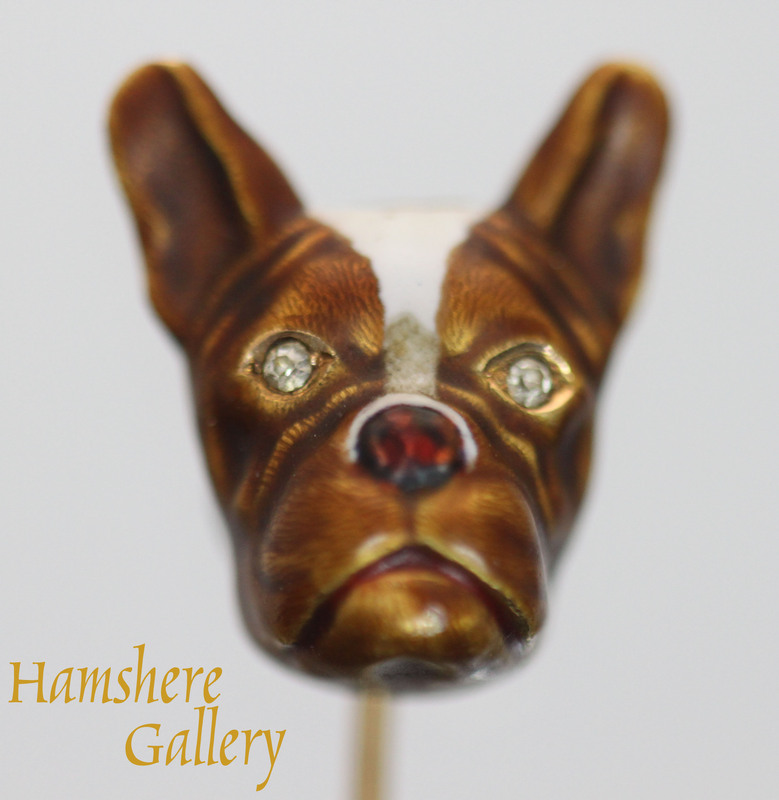 A 14 carat gold set enamel head study of a Boston Terrier set with old cut diamond eyes. The reverse of the stick pin is marked “14K”. 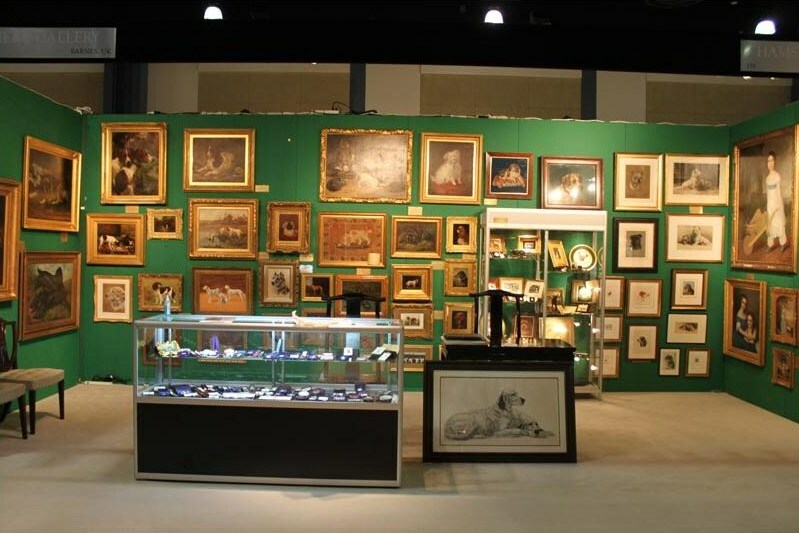 Such work was made in Newark New Jersey, by the likes of Henry Blank & Co., A.J. Hedges, Krementz & Co, Rilker Brothers etc.... American circa 1915. 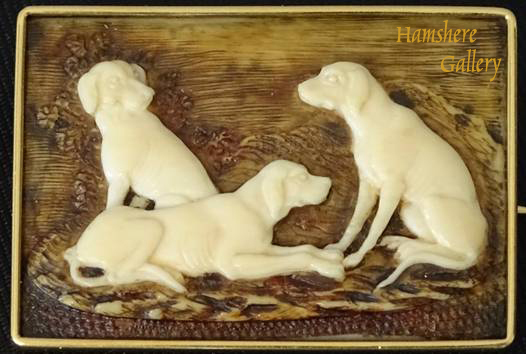 An ivory carved "Black Forest" depicting three Labrador type dogs, 18 carat gold set brooch. Assayed “OR 750” and marked “LB”. Such carvings were from German workshop of the Graf von Erbach-Erbach in Odenwald, and the Kehrer family at Erbach, Ernst (working 1830-40) and his son Edouard (1812-63). They were made from around 1830 to 1860. German, circa 1850. 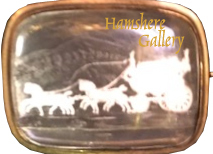 A rare English ‘Crystallo-Ceramie’ / ‘sulphide’ cameo four-in-hand coaching / carriage gold set brooch. ‘Crystallo-Ceramie’ / ‘sulphide’ jewellery was patented in 1831 by the glassmaker Apsley Pellatt. Such jewellery was very fashionable in the 1830’s and 1840’s. English circa 1840. 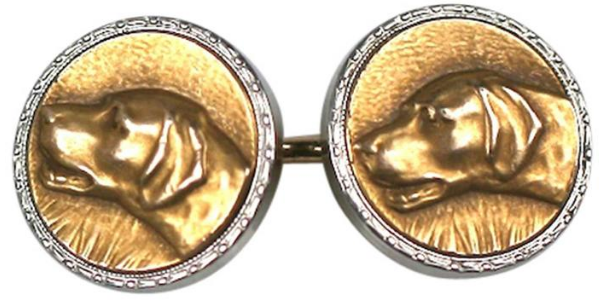 A set of double sided 1930’s Pointer cufflinks by the New Jersey firm of Krementz & Co. Withsilver pattern boarders and the silver plated bases marked “KREMENTZ”. American, circa 1930’s. Silver gilt Sealyham Terrier made by Suckling Ltd of Birmingham after circa 1925. From a series of breeds by the Birmingham maker that included, Setter, Sealyham, Scottish Terrier, Wire-haired Fox Terrier, and Airedale. Each clearly modelled from a show Champion of the 1920s. 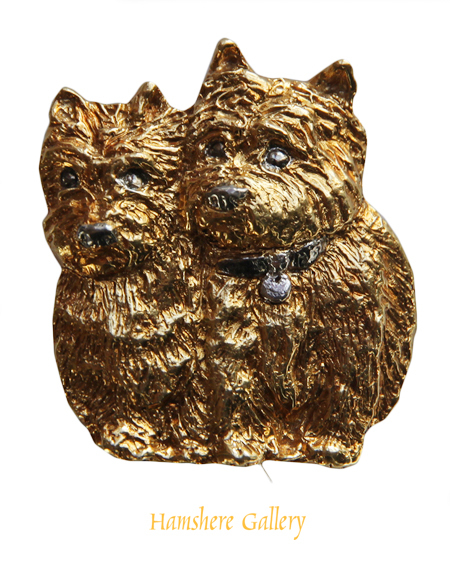 Silver gilt Scottish Terrier by Suckling Ltd of Birmingham after circa 1925. 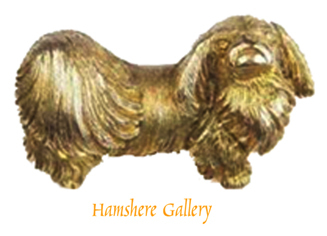 From a series of breeds by the Birmingham maker that included, Setter, Sealyham, Scottish Terrier, Wire-haired Fox Terrier, and Airedale. Each clearly modelled from a show Champion of the 1920s. 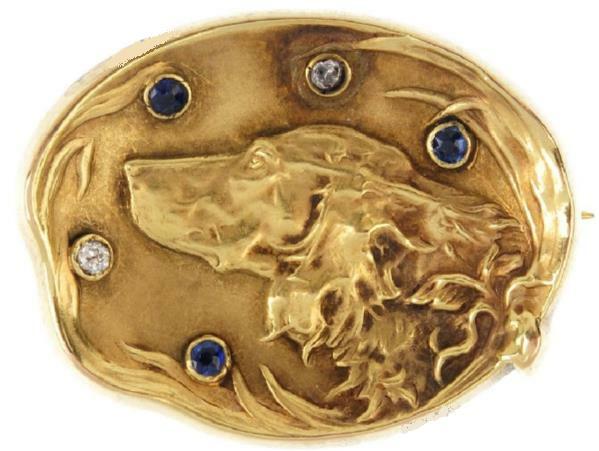 35 ) Early 20th century 14 ct gold Sloan & Co broach / pin of three Wire-haired Fox Terriers. Early 20th century 14 ct gold Sloan & Co broach of three leased Wire-haired Fox Terriers broach wearing red enamel collars. Stamped with the trademark of “Sloan & Co” and marked “14”. American, circa 1925. 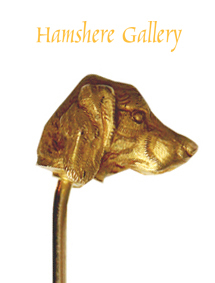 A silver book mark with Setter’s head. Assayed Birmingham 1908, and with makers mark “C.P.B”, Charles Penny Brown. 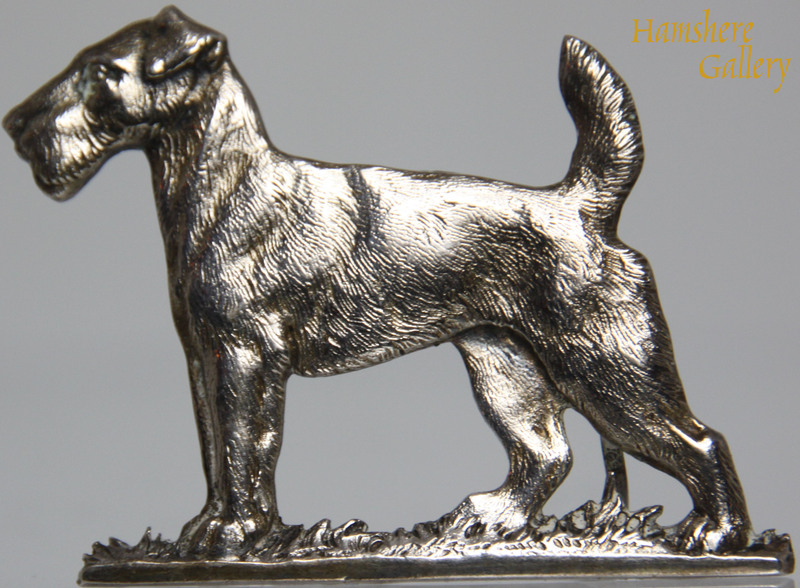 Brown was a London silver smallworker of fancy items, they also made a range of bookmarks with different breeds of dog's heads. They exhibited at the ‘British Industries Fair of 1915’. English, 1908. 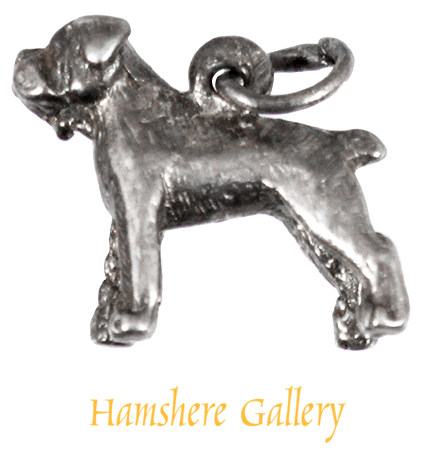 A silver late Victorian brooch of a head study of a Smooth-haired Fox Terrier / Jack Russell. The dog with glass inlaid eyes. English, Circa 1890. 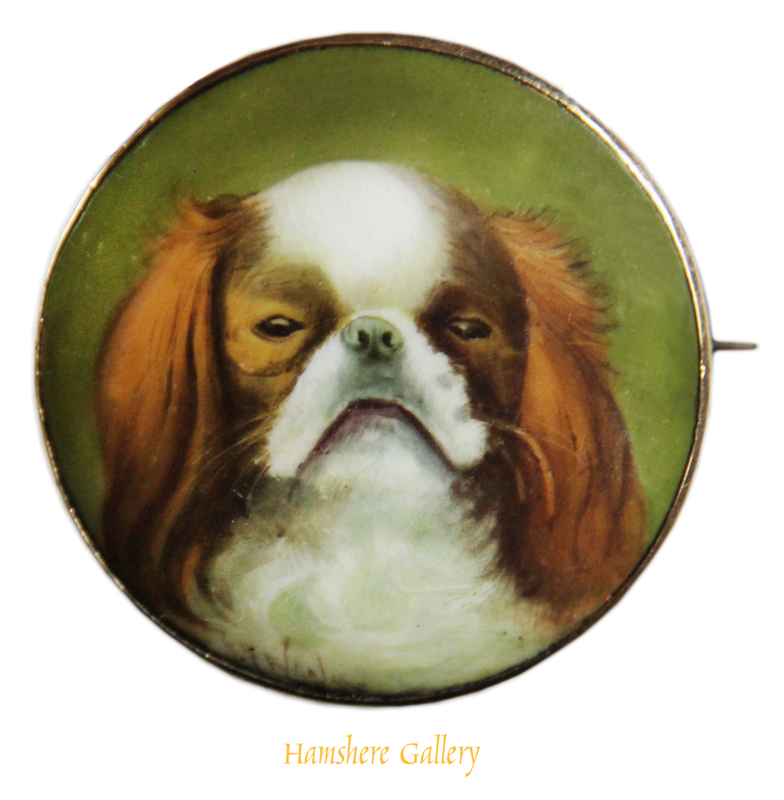 A late Victorian circa 1880�s enamel 15 carat gold set brooch / of an English Toy Spaniel / King Charles Spaniel. Signed to the face. Marked to the reverse �15CT�. 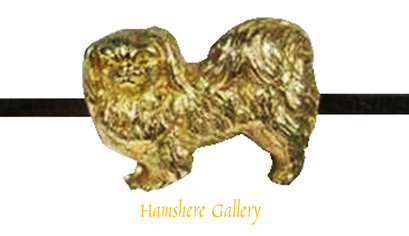 40 ) A 1960's 18 carat gold Cairn Terrier brooch retailed by "Garrard The Crown Jewellers"
A patinated bronze horse head, wearing a gold bridle, stick pin. French, circa 1860. Such work was done by Jean-Valentin Morel (1794-1860) et Henri Duponchel (Morel et Duponchel) based at Rue Neuve Saint Augustin. Their work was retailed in the rich Parisian market. 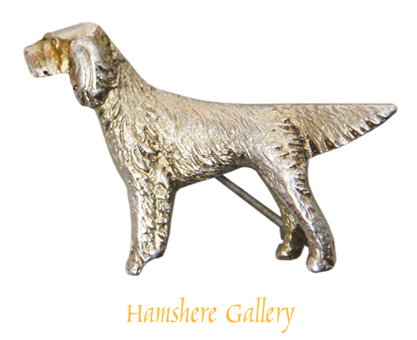 Silver English Setter/ Gordon Setter/ Irish Setter brooch made by Suckling Ltd of Birmingham after circa 1925. Marked to the reverse �SILVER�. 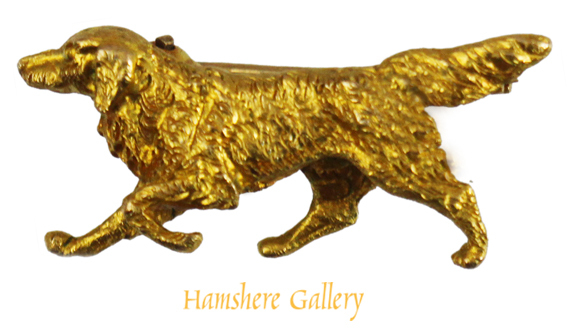 A late 20th century finely sculptured gold brooch of a running Setter by Alabaster & Wilson. Assayed Birmingham, �375� 9 carat, dated 1973, and stamped �A&W� for Alabaster & Wilson of Birmingham, famous for their fine jewellery since 1887. 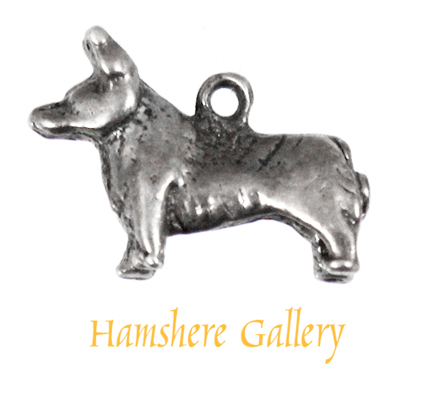 An English silver charm of a standing Corgi. 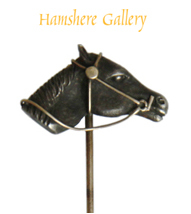 An English silver charm of a standing Boxer. 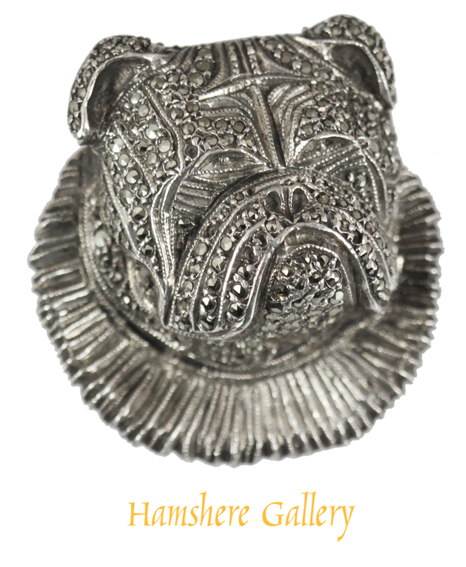 Bulldog silver marcasite brooch. The dog wears a ruffled collar. Circa 1920. 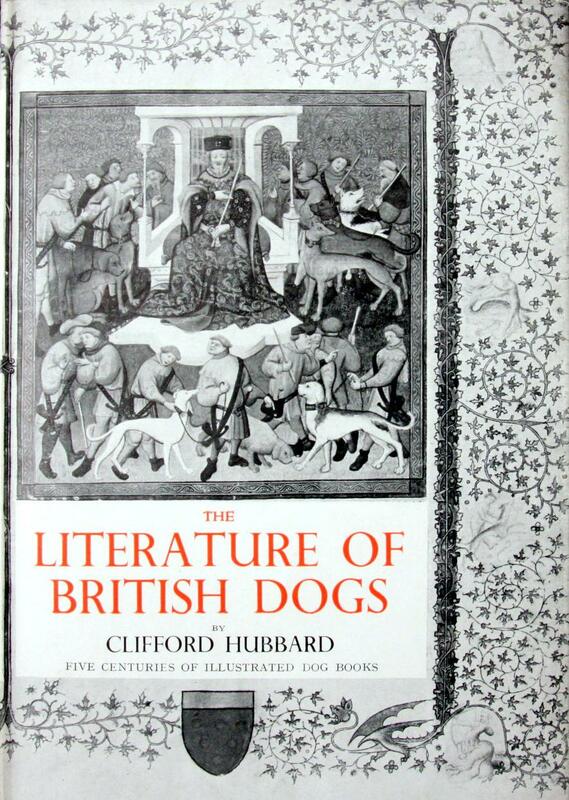 3) ?A Bibliography of the Dog: Books Published in the English Language 1570-1965? by Jones, E. Gwynne, published by Publisher: The Library Association, London, 1971. - ?A Bibliography of the Dog: Books Published in the English Language 1570-1965? by Jones, E. Gwynne, published by Publisher: The Library Association, London, 1971. Near perfect original red cloth-covered boards/white spine title, with pictorial gilt front board/original glassine dust-wrapper. 4) ?The Literature of British Dogs? by Clifford Lionel Barry Hubbard (1913-2000), privately published by the author at Ponterwyd, 1949. - ?The Literature of British Dogs? by Clifford Lionel Barry Hubbard (1913-2000), privately published by the author at Ponterwyd, 1949. Perfect dustjacket, green cloth with gilt lettering to the spine. 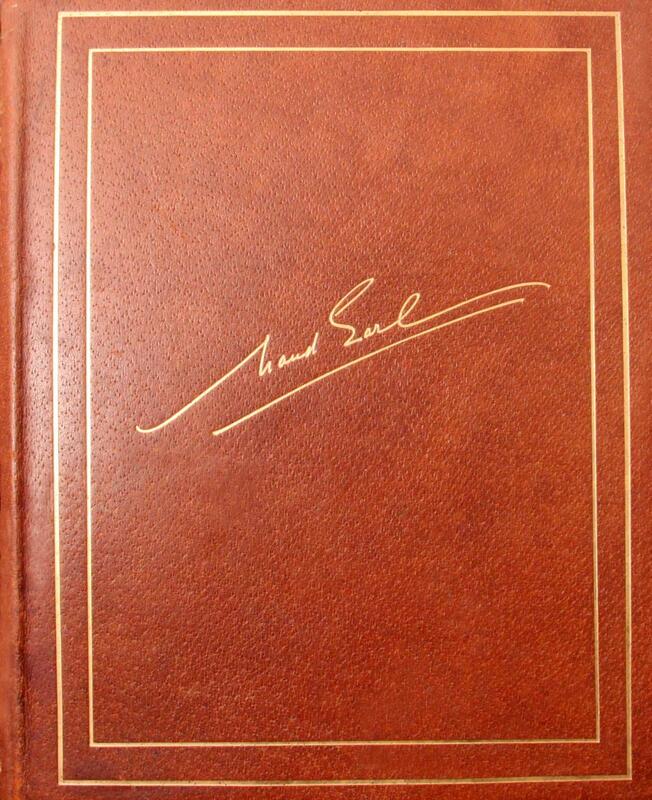 This is a rare copy with a special inscription by the author,Clifford Hubbard. 5) "The Power of the Dog" by Maud Earl (1864-1943) - The Power of the Dog by Maud Earl (1864-1943)and Arthur Croxton Smith (1865-1950) published by Hodder and Stoughton, London, 1911. This edition de Luxe is limited to One Hundred copies signed by the Artist? in ink. 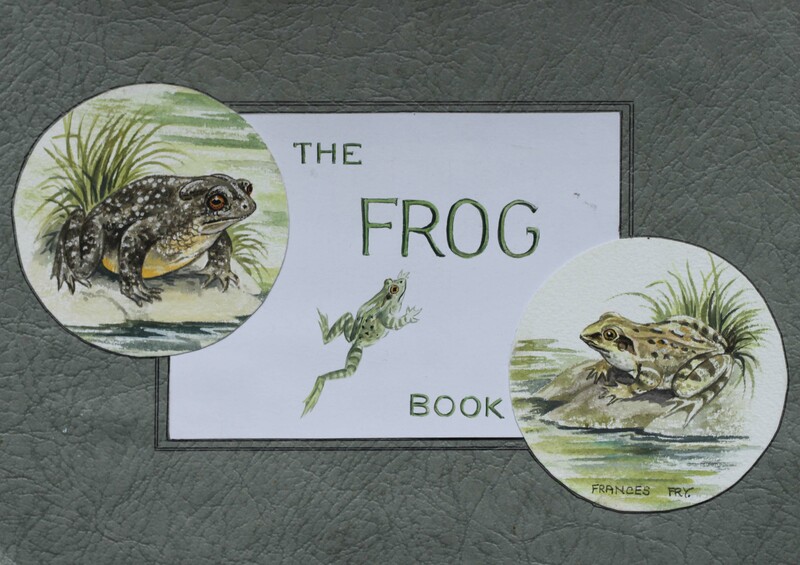 The cover in leather with gilt titles and signature, printed on thick art-paper with 21 tipped-in colour plates after paintings by Maud Earl, each with script about the breeds by eminent dog writer Arthur Croxton Smith. 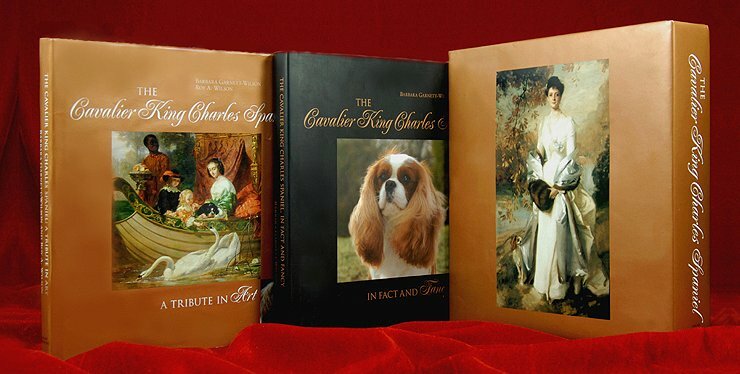 The breed chapters include the Pyrenean Mountain Dog, Foxhound, Bloodhound, Pointer, Greyhound, Welsh, Scottish, Boston, Bull, West Highland White, Fox, Sealyham Terriers, Pekingese, Miniature Bulldog, Chow, Griffon Bruxellois, Pomeranian, Springer Spaniel and Miniature Poodle This ?Edition de Luxe is limited to One Hundred copies signed by the Artist? in ink. 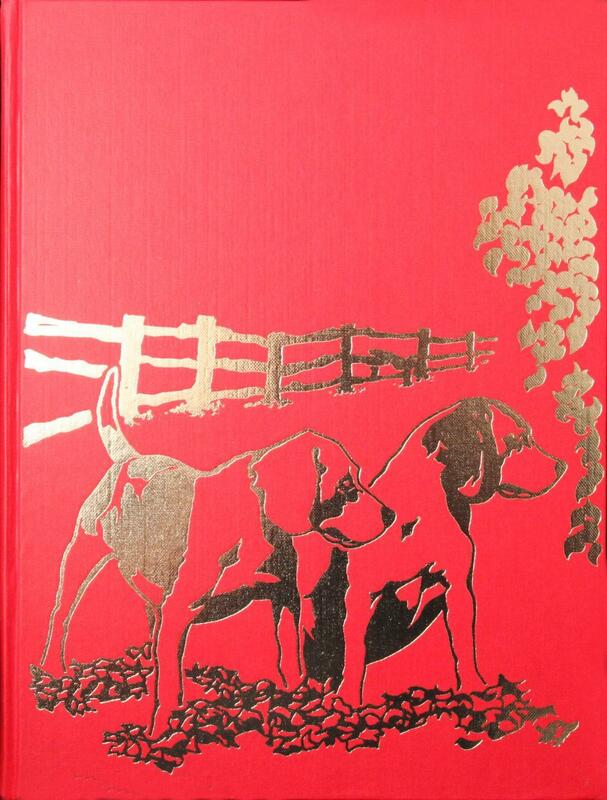 The cover in leather with gilt titles and signature, printed on thick art-paper with 21 tipped-in colour plates after paintings by Maud Earl, each with script about the breeds by eminent dog writer Arthur Croxton Smith. 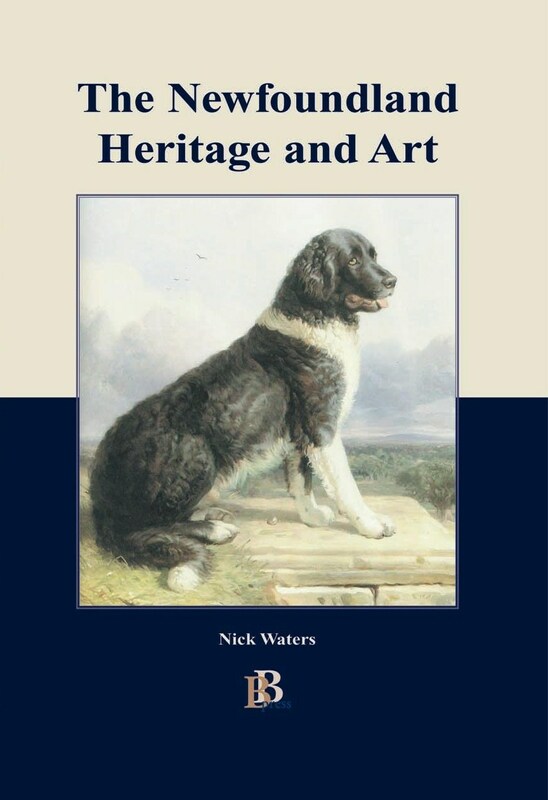 The breed chapters include the Pyrenean Mountain Dog, Foxhound, Bloodhound, Pointer, Greyhound, Welsh, Scottish, Boston, Bull, West Highland White, Fox, Sealyham Terriers, Pekingese, Miniature Bulldog, Chow, Griffon Bruxellois, Pomeranian, Springer Spaniel and Miniature Poodle.